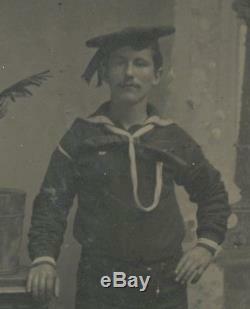 Offered here is a nice CDV-size post-Civil War tintype featuring a handsome young sailor of the US Navy. He stands in a photographer's studio dressed in his uniform and cap, with a watch stripe on his upper arm and with his hand resting on a table. An unusual impressionist background is on the sailor's other side. It has been trimmed into an oval shape to fit the frame and measures approximately 2 3/8" x 3 1/2". The image comes in a lovely thermoplastic frame measuring about 4 1/8" x 6 1/8", which is in excellent condition, free of cracks and missing pieces. 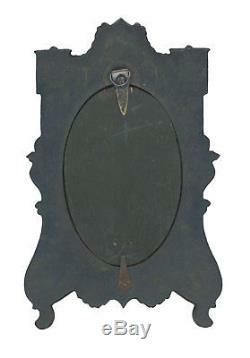 The image fits snugly in the frame and is held securely in place with an oval-shaped piece of wood on the reverse, with two swiveling metal pieces and a hanger that appears to have been added at a later date. 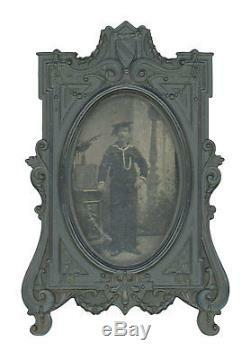 A nice image of a post-Civil War US sailor in a lovely thermoplastic frame. Please see my other items for more interesting and original Civil War pieces. 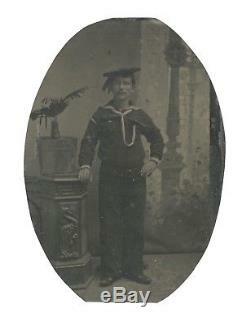 The item "CDV-size Post-Civil War Tintype of US Navy Sailor in Rare Thermoplastic Frame" is in sale since Sunday, August 5, 2018. This item is in the category "Collectibles\Photographic Images\Vintage & Antique (Pre-1940)\Tintypes". The seller is "iron-horse-sales" and is located in Champaign, Illinois.